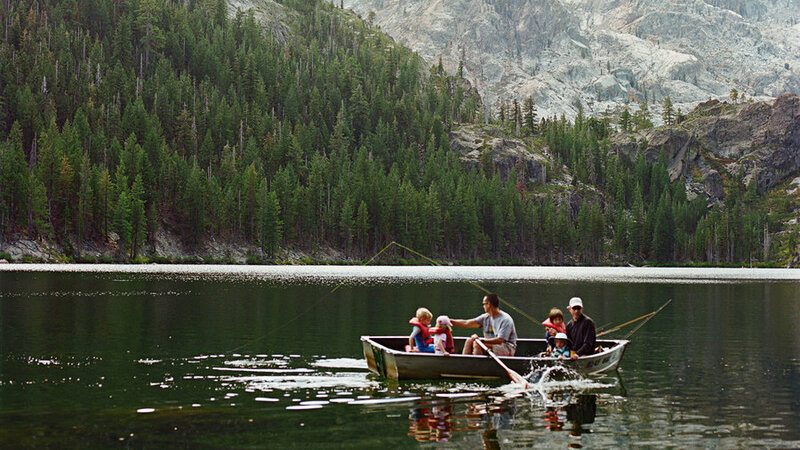 Float under the gaze of the Sierra Buttes in Lower Sardine Lake. Why go in summer: A cool pine forest laced with bracing-cold streams sounds just right. Never heard of Sierra City? Most don’t make it farther up State 49 than Downieville. But the few who do wind 12 more miles up the canyon find a tiny mining town where afternoon highs aren’t so high and an old-fashioned slowness mellows out the mood. The town’s crown: The towering, craggy Sierra Buttes. Pile your plate high: With ribs, salmon, and peach cobbler at Friday and Saturday BBQs, set in manicured gardens beneath tall pines (Jun 11–Aug 28; from $37; book early; 530/862-1333). Talk about a backyard … Sierra City is the gateway to legendarily beautiful Lakes Basin—an idyllic cluster of high-country lakes joined by foot trails through fields of wildflowers—and its hard-to-book lodges. 1. Float on a boat: Rent a rowboat ($30 per day) or a blissfully silent electric motorboat ($60 per day) to float below the Buttes on the Lakes Basin’s lovely , 15 minutes from Sierra City. Some fish, some doze, some launch their own kayaks and paddle off. The reward for a half-mile hike from here is perfect solitude at Upper Sardine Lake. Off Gold Lake Rd. In summertime, a cool pine forest laced with bracing-cold streams sounds just right. Take a dip in ice-cold swimming holes, hike through fields of wildflowers, then jump back into the crisp alpine waters to cool off again. 2. Jump right in: The North Yuba River is made for swimming holes. Anywhere along this stretch, you’re likely to find a deep, clear pool where you can leap from a boulder into water that’s icy-refreshing. One hole is big enough to be considered the town’s swimming pool: From Main Street near Buttes Resort (see “Make It a Weekend,” below), hike a trail to the water, spread your towel on a warm rock, and splash in. Take in a view of the Sierra Buttes on Mountain Creek Restaurant’s patio. 3. Table with a view: On Mountain Creek Restaurant’s terraced patio, a stream rushes down the middle, grapevines and flowers are all around, and there’s a crowning view of the Sierra Buttes overhead. Talk politics with the locals over coffee and a scramble, or take in the thick soup of stars overhead (with fresh-made soup of the day) on a warm summer night. $$; 225 Main St.; 530/862-1171. 4. Walk among the wildflowers: In the Lakes Basin, Round Lake loop delivers bouquets of wildflowers—mountain lupine, Indian paintbrush, columbine. Plus, as you walk the 4 miles, you’ll arrive five separate times at a picture-perfect lake in a glacial basin with crystalline water to wash off the trail dust. From (off Gold Lake Rd. ), follow signs for Round Lake, then Silver Lake, Long Lake, Cub Lake, Little Bear Lake, and finally Big Bear Lake. Many of Buttes Resort’s charming cottages have decks that hover just above the river—the perfect place to watch the day go by. 5. Make it a weekend: With a faintly alpine charm, cottages are steps from everything in town. Pick a room with a deck above the river (4, 7, 9, 10, 11, or, our favorite, 12) for a view of pine-forested hillside. Most rooms have barbecues and kitchens. Leave the windows thrown open to catch the nighttime chorus of crickets and the river’s constant, gentle whoosh. From $85; two-night minimum. Quick cool-off: Just past the fire station, a gazebo shelters a fountain with a constant stream of fresh spring water—a pleasant (and free) place to fill bottles. Need a book? The library is rarely open, but on its front porch, you can browse shelves of books that are yours for a donation in the jar. Map it out: If you’re here to fish, the $2 Lakes Basin map sold all over town will be just fine. To do any serious hiking, though, spring for the $12 topo map sold at Bassetts Station (100 Gold Lake Rd. ; 530/862-1297). Don’t forget: Your water shoes. This place is all about getting into rivers and lakes—not always easy on feet.